The Special Study Session yesterday - the second in a series of three that had been scheduled this month - provided some good information to the few of us who attended. I hope more of you had a chance to view it live on CMTV or will view the streaming video when it's available or catch it on taped replay. We learned that the long-delayed improvements of the present terminus of the SR-55 Freeway at 19th Street - the "SR-55 Gateway Improvement Project" - has found funding so the City needs to move forward in the upcoming fiscal year. It will cost around $500,000 to make the improvements recommended. You can read the staff report, which includes examples of proposed monuments and landscaping plans, HERE. Those improvements are a new monument welcoming those visitors stalled in traffic as they come out of the ditch to Costa Mesa as well as some very significant landscaping enhancements. Most of the council members didn't like the staff's choice of a monument, so it's back to the old drawing board. It was generally agreed that the language should probably say, "Welcome To Costa Mesa - City Of The Arts". There was no definitive solution to what language, if any, might be placed on the back side of the monument for folks to view as they departed up the freeway. As I listened to the discussion I thought, perhaps, a simple "Drive Safely" might work. Regardless, we'll hear more about this project soon after the staff massages the monument style a little. The second item on the agenda was an update of the Street and Alley Pavement Needs. Public Works Director Ernesto Munoz presented a very thorough, professional report for the council. He revisited the March, 2011 Pavement Management Overview, then updated the numbers based on the improvements made since that time. You can read the staff report HERE. The graphics included will be helpful. The City uses a Pavement Condition Index (PCI) to determine the condition of our streets and roadways. It's a scale that ranges from 0 to 100. Since the first presentation of this PCI the condition of our streets have improved from 77.6 to 79.7. Here's a little chart that will help you understand the PCI levels and shows the improvement. The city is also concerned about the condition of the alleys around town. Using the PCI, the chart below shows the progress being made with them. From a funding standpoint, most street and alley improvements are made using state and federal funds. In order for us to continue to improve the status of our roadways and alleys, to bring the roads to 85 on the PCI and eliminate every "Poor" alley, beginning in the budget year 2013/2014 it will be necessary to supplement those funds with other funds - General Fund dollars - to the tune of $4.7 million for streets and $1.4 million for alleys - $6.1 million annually. Where those funds come from is the BIG question facing this - and future - councils. The council then heard the report on the City's Master Plan of Drainage. You can read that staff report HERE. Again, there are some major problems throughout the city when it rains. The conclusion from the staff report tells us that it will cost at least $16.5 million to resolve every drainage problem and that solving the "hot spots" - those predictable and critical areas where flooding occurs - will cost $4.1 million to fix. Typically, drainage fees for new development and redevelopment are used and coordinated with federally and locally funded street improvement projects. A lack of grant funds available has caused there to be insufficient funds available to rapidly correct all the drainage problems in our city. The next Special Study Session will be held next Tuesday, May 29, 2012 at 4:30 in council chambers. Expect the council to continue to address infrastructure issues in anticipation of the 2012/2013 budget process. A sidebar from the meeting Thursday. Several of the council members made reference to the term "wish list" as the meeting progressed. They take offense at the suggestion that some of the projects on their 5-year plan are, in fact, "wishes" not "needs". Wendy Leece expressed the hope that the council will attempt to balance their wishes for infrastructure improvements with the needs of public safety - police and fire - and other services that the residents expect. Based on their universal lack of response to her observations, I don't have a very good feeling about how this budget process is going. The only place there is money to fund the "wishes" is in the bucket that holds the dollars for the "needs" - the pay and benefits of the employees of the city. For the back side of the monument I think... "JUST LIKE OUR CITY EMPLOYEES.... YOU ARE NOW LEAVING COSTA MESA"
And to those employees who agree with JUST TRY'N TO HELP: Since every other city except Costa Mesa is flush with cash, good luck in your new government job there. Don't let the sign hit you on the way out. 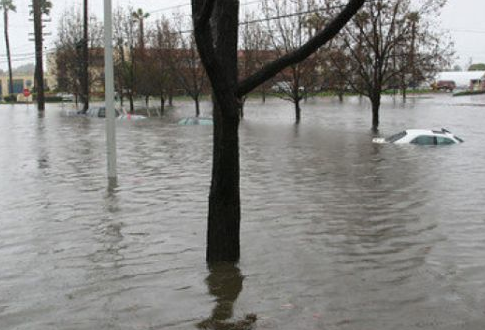 NEED = Repairs to Costa Mesa's drainage system to prevent routine flooding in certain parts of the City. Some residents have been complaining for years, but the money isn't there. WISH = City taxpayers continuing to pay the employee share of public safety pensions. WISH = Public safety associations hoping that residents keep buying the "we don't trust the Council so we won't make any concessions" mantra. WISH = Hoping residents buy the "well over $3 million fire OT in 2011 was because council wouldn't let us fill a few positions" nonsense. $4.1 million and more to fix all critical drainage issues could have come from public safety in 2011, with no impact to operations or salaries, only fire OT and fire and PD employee share of pension payments. NEED = Fire OT audit.